Loving all of the details in these bathrooms...especially in that top bathroom. That tiling is incredible, just breathtaking! love this post. working on a bathroom reno right now. 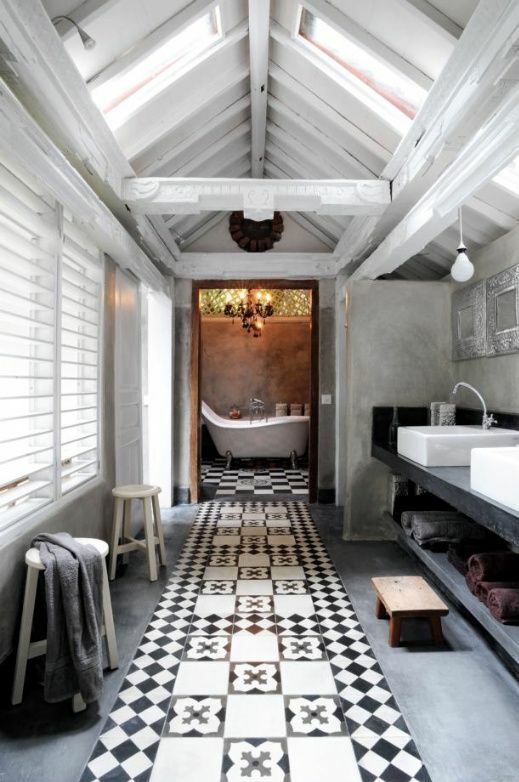 I love the shapes of the tiles on the floor- they are so gorgeous! Thanks for sharing these photos- they are truly inspiring! how do we become ridiculously rich? no really. please tell me. i must be filthy rich. I just stumbled across your blog for the first time and thought I would say hello! I looked through a few of your posts and love your style. Your blog name and story are adorable! I'm a blogger as well, about the world of art, but my history is in interior design and fashion. I love to hear what people are saying! Hope we get to see more of each other in the future. I am kind of looking for some interior design bloggers to do some blog collaboration projects with. Let me know if you would be interested! I have had your beautiful blog open ALL DAY and keep flitting back to it for eye candy. Love it all. Don't know how you do it (but keep doing it!!!). Love the pop of color and sweetness in the first bathroom. Thank you so much for your comment Christina! I've posted about Argentina last weekend, with a few pictures for you to see. Besos! 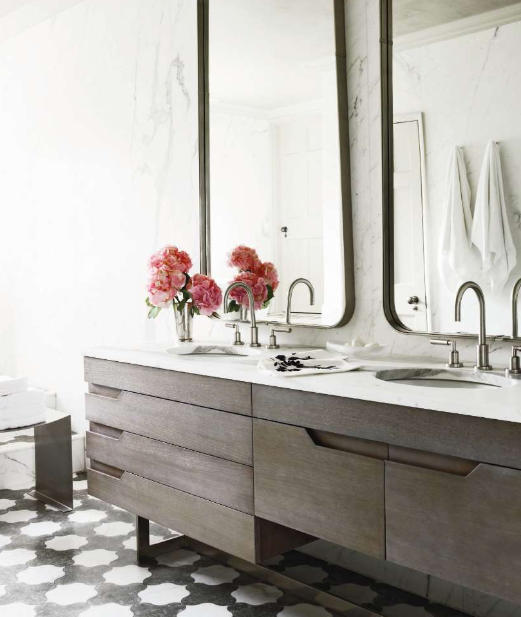 the flooring in all of these bathrooms is STUNNING. and you are so right about all of those little details that take a room to the next level. Oh my gosh, those bathtubs! I can't wait until I can get out of this stupid apartment and have a house with a real tub that I can lay down in! *sob*! I'd take any of those. Amazing bathroom! i actually thought about that when we were putting them up. and thought about it again when my friend gasped when she saw them because it was the first time she had ever seen bubble lights. boyd built our fireplace. it's made out of precast concrete. then i painted it. i like it painted. however, if i could go back i probably would have left it raw. I love the flooring the most--such contrast. I agree, it is an incredible bathroom. The details are amazing and the theme is very original. I wonder how much it will cost to have that kind of bathroom. Does anyone know where to find those amazing tiles in the first picture, or similar ones?